I saw for making the other day and I was very intrigued. So naturally, I had to try it for myself. I was really happy with how they turned out. 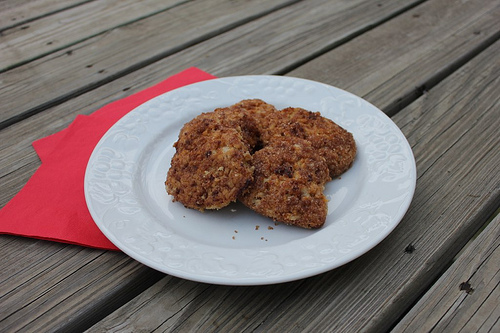 They were yummy, easy to make, and with the alterations I made to the recipe, they are good for you, too. Best of all, we had hot biscuits without heating up the house! Now I’m all inspired to try making other breads in the crockpot! 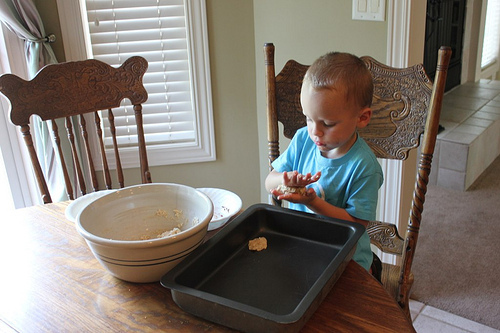 I let Silas make his own biscuits with some of the leftover dough! While the original recipe calls these Cinnamon Rolls, since they aren’t rolled up in any manner, I changed the name of the recipe to Cinnamon Biscuits, as that seemed better suited. 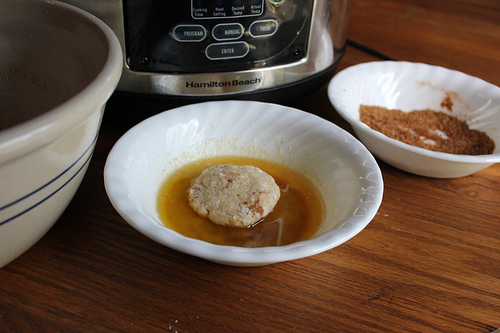 Thoroughly grease the crockpot with butter or shortening (I use palm oil shortening). Melt butter in the microwave or on the stovetop and stir vanilla into it. Pour into a small bowl. Dip biscuits into melted butter mixture, then into cinnamon sugar mixture. Put in crockpot in a single layer. Cover the crockpot with a tea towel or paper towel (to reduce condensation) and put lid on. 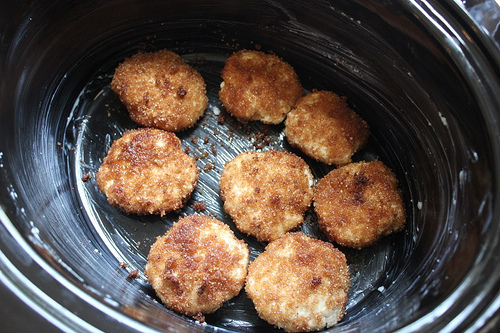 Turn crockpot on low and bake biscuits for 2-3 hours until done. You can glaze with a powdered sugar & milk glaze, if you’d like. Or you can leave them unglazed like I did. I thought they were plenty sweet without the glaze! I am all for not using the oven in this crazy heat! I have busy searching all types of crockpot recipes. It is my best friend this summer. I had just posted a question about making this GF by using the GF bisquick… Thanks for your recipe as well. I’m also pregnant and these sound great! Jen – I’ve never made that GF monkey bread before, but I’ve liked every recipe from Nicole at Gluten Free on a Shoestring, so it’s bound to be good. It’s at least similar to this recipe – and that works for me. 🙂 Hope you enjoy it! My mother-in-law gave me the cookbook for Christmas, but I haven’t really done anything with it yet. I’ve been so tired and sick with morning sickness kicking in full force in Jan and woking full time on my feet. Due in another 3 1/2 weeks and looking forward to doing a bit more. I’ll be done with work in about a week and a half, so I’ll be looking through all of my books for some good freezer-cooking recipes to make up for those first few weeks after baby arrives! How funny – I got the cookbook for Christmas from my MIL, too! I’m just now 11 weeks pregnant so I’ve got a ways to go. 🙂 Blessings as you have your new baby soon! Did these rise like a normal biscuit would rise when baked in the oven? They still look flat but maybe it’s just the picture. They weren’t all big and puffy, but they did rise. They were flatter than many biscuits, but still very yummy — probably the flatness was a combination of baking them in the crockpot at a lower temperature, the baking mix I used, and the fact that I didn’t make them very thick to begin with. I like your crockpot; is it new? I don’t remember seeing it before now. Does the insert go on the stove top to brown meat? I’ve had it for a year and a half or so. My first crock pot (a wedding present), cracked down the middle after so much use so I finally had to replace it a year and half ago. Do you think this could be successfully made gluten free using the GF Bisquik? Inspired to make these for a snack while we watch the Olympic Opening Ceremonies tonight. You said to cover the crockpot with paper towels. 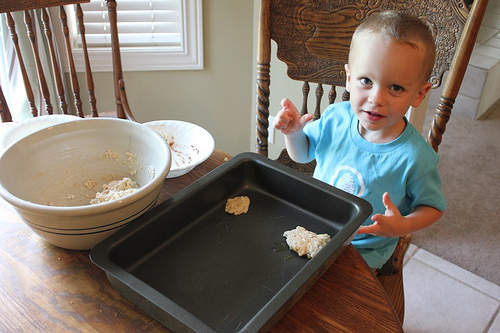 Do you put the paper towel all the way up by the lid, or lay gently down over the dough? I put a tea towel on the top of the crockpot before putting the lid on. Looks like she says “low” near the bottom of the recipe. Whoops, that’s kind of important, isn’t it?! Low. Those look so good. I will have to try this. I use my crockpot a lot but I am still venturing into the area of breads and desserts. Wonder if canned refrigerated biscuits would work for this recipe? Has anyone tried this? We made these this morning and they were amazing! 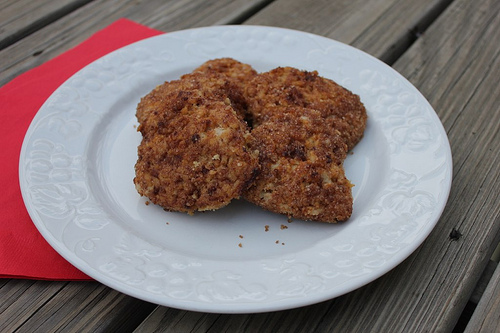 We did use Bisquick (yikes)…so it wasn’t as healthy as yours…but they were very good! Thanks! 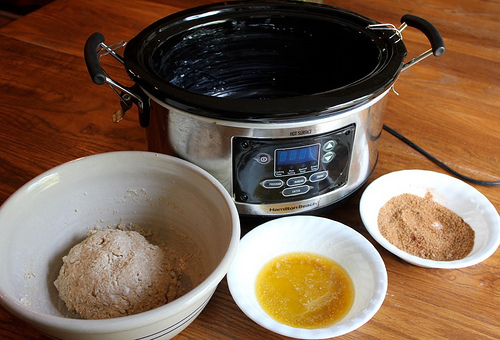 You can bake a lot of things in a rice cooker too. I just learned to make banana bread in the crockpot! Loving making “baked” goods without heating up the house! Do you have a recipe? I’d love to try that! Sweetened condensed milk makes a yummy “glaze” and it’s super easy. I rarely glaze stuff either though. I loooove cinnamon. I like being able to go crazy with it. I think I might try this as the original post suggested with the frozen rhodes bread dough. 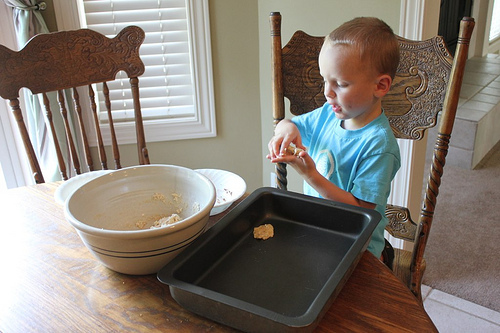 How much baking mix and milk to make it into a biscuit dough?